5/5 stars. You can always rely on Peter James for an original and ingenious plot and story. Simply brilliant. Amid the tragic unfolding mayhem of the morning of 9/11, failed Brighton businessman and ne’er-do-well, Ronnie Wilson, sees the chance of a lifeline: to shed his debts, disappear and reinvent himself in another country. Six years later the discovery of the skeletal remains of a woman’s body in a storm drain in Brighton leads Detective Superintendent Roy Grace on an enquiry spanning the globe, and into a desperate race against time to save the life of a woman being hunted down like an animal in the streets and alleys of Brighton. Dead Man’s Footsteps is the fourth novel in the multi-million copy bestselling Detective Superintendent Roy Grace series, from number one author Peter James. The more Roy Grace novels I read, the more I enjoy them. Each one has a unique and ingenious plot that never fails to deliver an exciting and enjoyable read. And central to it all is Detective Superintendent Roy Grace as his trusty team, who work all the hours needed to solve some heinous crimes. This one’s no different, with a story that spans the 9/11 disaster in New York to the mean streets of Brighton, where illusions are soon shattered for one young woman as the story alternates between the past and the present. 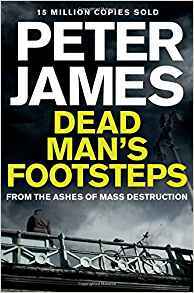 Peter James never fails to create frightening villains who show no mercy or lack of ingenuity when it comes to disposing of their victims. But then that’s the trademark of these great novels – authenticity. The police operations are revealed in detail that not only takes you inside the incident room, but through the internal and external politics, bureaucracy and camaraderie essential for maintaining sanity while dealing with the most horrific crimes. Exciting, fast paced and full of surprises, I particularly enjoyed the depiction of the events during and after 9/11. While I cannot begin to imagine the horror of being there, Peter James brought it to life with such vivid detail, the terrible impact of that day took on a new meaning for me. And after all the twists and turns and the thrilling climax on Beachy Head, the author still managed to slip in one final twist, right at the death. It won’t be long before I start the next book in the series – just got to get my breath back.